Just before Christmas I had a day in London with my Mum and, as always, planned our day around what we were eating. When I go down to London I rarely eat at the same place twice. There are SO many amazing restaurants, cafes, deli, bars etc to choose from and I want to try EVERYTHING. I stumbled across Kopapa, I can't remember if it was a tweet or whether it was a sponsored post on Facebook but either way, I had a look at the menu and I was intrigued. 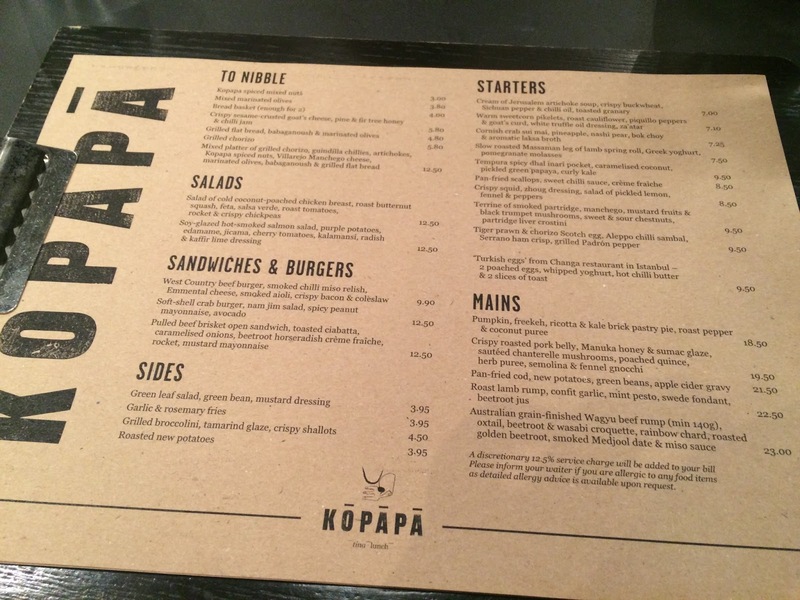 Kopapa is owned by a team of four New Zealand raised guys, two of which with Maori heritage, hence the Maori term 'Kopapa' meaning 'a gathering, to be crowded, and a building to store food in'. Hits the nail on the head really! They serve everything from breakfast to small plates, mains - all fusion food. The menu really is something to get excited about. Crispy sesame-crusted goats’ cheese, pine & fir tree honey & chilli jam. This was my favourite dish, the creaminess of the goats cheese and the crunch of the sesame seeds worked so well together with the sweetness of the honey and the slight edge of the chilli jam. The textures and flavours were incredible. Slow roasted Massaman leg of lamb spring roll, Greek yoghurt, pomegranate molasses. Again, another amazing dish with perfect flavour combinations. The lamb almost melted in your mouth, team that with the incredible light pastry it was in and the pomegranate and yoghurt, it was full of flavour. Tempura spicy dhal inari pocket, caramelised coconut, pickled green papaya, curly kale. This is what we ordered but I'm not entirely sure it's what we got. Either way, it was really good - not one of my favourites but still tasty. Again, the mixture of flavours really worked and the dish, for me, was really about the crunchiness combined with the soft dhal. Always a firm favourite of mine. I eat A LOT of hummus and make my own so I can be quite particular if the consistency isn't right but this was great. The flatbreads were also really, really good. However, I'm not sure they were completely yeast free (for my mum's sake due to an intolerance) but she seemed fairly pleased. There's nothing more satisfying than a really good homemade flatbread and hummus. Although the service was really good - they brought the food out in a staggered way so we didn't have everything on the table at once and the wait for our order didn't take long at all. I found our waitress and the one that seated us to our table quite cold. Don't get me wrong, they weren't rude or unhelpful in any way, I just didn't find them overly friendly for people that work in hospitality. Maybe it was due to the Christmas rush, lots of Christmas parties - I don't know - but I felt they could have been a little warmer. That said, our dining experience was really good - high standard of food and definitely a menu that was doing things a little bit differently. I may have to eat my own words - this may be somewhere I have to go twice! Yum their lunch menu looks incredible! I've only been to Kopapa for brunch and absolutely loved it!